These elegant double-story Victorian terraced houses have the hallmark architectural characteristics of an era when space was no obstacle. 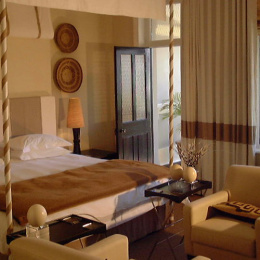 The rooms are spacious, the ceilings high and the original walls reassuringly thick and solid. Dating back to the late 1800's the new building has been refurbished and decorated in a sophisticated contemporary African style. The air of calmness which is immediately noticeable in the house is achieved by skilful use of play of light, sensitive use of colour, subtle texture and pattern play which is uniformly applied throughout the house. The Villa is situated half way between the Victoria and Alfred Waterfront and Table Mountain Cableway in a quiet residential quarter with a lovely 'village' feel within a short stroll of the centre of Cape Town and a large number of its best restaurants. At the heart of the house, as you may expect, lies an enormous and welcoming kitchen. Breakfasts are served either in a spacious dining room or, weather permitting al fresco, in our marvellous courtyard beside the pool. Friendly housekeeping staff, Susan, Portia and Phumza, are on duty to prepare a hearty, cooked breakfast (included in the rate) and to service the rooms. Cedric our maintenance man and porter is always on hand to sort out those little challenges which a 120-year-old house likes to toss at us. Two night porters (Xolani and Boni) complete the team.